The City of Bismarck has begun installing flashing yellow-arrows at intersections. The first flashing yellow turn signals will be installed in 2015 and are located at the intersections of 26th Street and Main Avenue and 43rd Avenue and Centennial Road. Additional flashing yellow turn signals will continue to be installed in the future. How does the flashing yellow left-turn arrow work? A flashing yellow arrow means left turns are permitted, but you must first yield to other traffic and pedestrians, and then proceed with caution. The flashing yellow arrow replaces the green ball indicator for a yielding left turn. How should drivers approach a flashing yellow-arrow? Drivers yield to oncoming traffic. If and when it is safe, make the left turn and proceed through the intersection. When a flashing yellow arrow ends, the solid yellow arrow begins, meaning the left turn signal is about to change to red and drivers should prepare to stop or prepare to complete their left turn if they are in the intersection. Steady red = STOP. Left-turning drivers must stop and wait. Steady yellow = WARNING/CAUTION. The left turn signal is changing to red. Flashing yellow = CAUTION. You may cautiously turn left after yielding to oncoming traffic and pedestrians (similar to a green ball). Oncoming traffic will typically have a green light. Steady green = GO. Left-turning drivers have the right of way. Flashing yellow arrow left turn signals have been shown to be safer, more efficient, and more flexible than traditional signals. Safety: A national study showed drivers made fewer mistakes with flashing yellow arrow indications than with the existing green ball indications. Efficiency: Green left turn arrows can be used either before or after through traffic has a green ball. This improves signal timing progression and traffic flow in signalized corridors. Flexibility: Left turn signal operations can now change during the day to better respond to fluctuations in traffic volumes. For example, during rush hour if there are few gaps in oncoming traffic, the signals can be more restrictive and only allow left turns on a green arrow. When rush hour is over and there are more gaps in oncoming traffic, the signals can then be less restrictive and allow left turns on green arrows and/or flashing yellow arrows. Federal Rules: For new traffic signals, green ball indications are no longer allowed over left turn lanes. 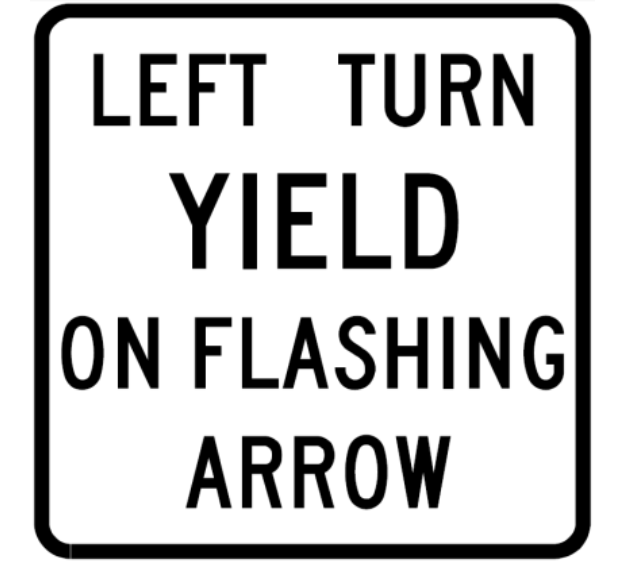 A sign similar to that below will be installed for the flashing yellow arrow signals.